Weakland's Heating & Air Conditioning, Inc. is committed to reducing our carbon footprint for our grandchildren and yours. A greener workplace can mean a lighter ecological footprint, a healthier and more productive place to work, and good news for the bottom line. Whether you're the boss or the employee, whether your office or home is green already or still waiting to see the light, these practical steps can lay the groundwork for a healthy, low-impact workspace. We are knowledgeable in the latest technology that focuses on energy-efficiency so we can help you pick a "green" Heating or AC system to install. The added benefit is "Uncle Sam" rewards you with tax credits and Energy Star rebates and that is in addition to any coupons or promotions we are already offering! When we perform your annual heating Tune-Ups and AC Clean & Checks, we use the latest technology. We do this to ensure your systems are running as efficiently and safely as possible. We take extra steps to help the planet as well as your wallet. Also, if you are spending less on fuel because you have an efficient system, it's like getting free fuel! We install and promote AC systems that use R410A refrigerant instead of the R22 Freon that damages the environment. We are ahead of the curve. In fact, R22 Freon production is being phased out world-wide by 2010 because of its harmful impact on the environment. We don't just add more refrigerant we find the leak and repair it before the refrigerant can do any more damage to the ozone. 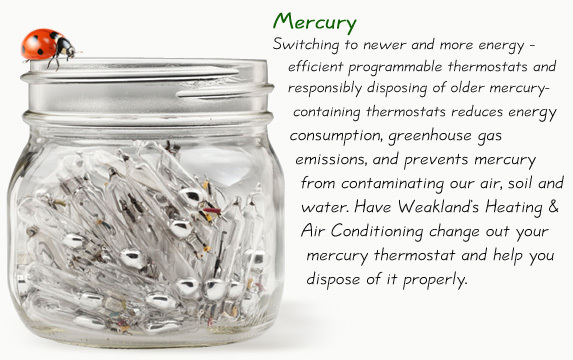 We recycle old mercury thermostats instead of putting them in the landfill. We recycle all of our ink cartridges. We recycle our used cell phones & batteries at Whole Foods. We use rechargeable batteries in most of our equipment when we can. We vigilantly maintain our service trucks to ensure maximum gas efficiency so that they don't "guzzle" gas. We keep current with oil changes and engine tune-ups. Some paper use can't be avoided, we use recycled paper and envelopes that have been processed and colored using eco-friendly methods. Pens and pencils can also be made of recycled materials, and refillable pens and markers are preferable to disposable ones. We use biodegradable soaps and recycled paper or cloth towels in the bathroom and kitchen, and use biodegradable cleaners. 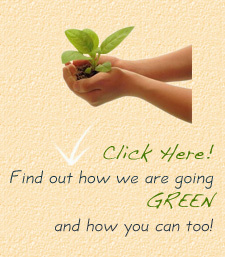 We buy in bulk so that shipping and packaging waste are reduced, and reuse the shipping boxes. Recycling printer & copier cartridges is often free, and recycled replacements are cheaper than new ones. We take old magazines to our doctors office so they can be enjoyed a second time or donate them to our kids schools for art projects. We wash are rags in cold water whenever possible. As much as 85 percent of the energy used to wash clothes goes to heating the water. When we schedule our service calls we try and make the appointments on the same side of town to so we don't waste gas sending our guys all over town. The owner's car pool to work as often as possible. We bring lunch to work in reusable containers. We have a mulch pile outside so when we clean up the leaves or mow the lawn it goes right in to it. We support our local economy and buy local whenever we can. We turn off all of our computers, lights, calculators & printers at night. We have all of our bills delivered to us paperless. We turn off the lights when we leave a room. If your furnance or air conditioner is 20 years or older call Weakland's Heating to come out and give you a free quote on replacing them with an new energy efficient one, so we can help you pick a green heating or cooling system to install. Turn down or up the temperature depending on the season when you are not going to be home and at night while you sleep. Changing the temperature by 1 or 2 degrees can make a dramatic change on your utility bills. Better yet upgrade to a 7-Day Programmable Thermostat and let the thermostat do the work while you save. These devices can save about $180.00 a year. Turn down the temperature on your hot water heater from the standard 140 to 120 degrees. This cannot only save you money on your monthly utility bills but could also prolong the life of the hot water heater. Change your air filters regularly. The harder your HVAC unit has to work, the more energy it eats away. Energy Star suggests changing filters a minimum of every three months. Seal your heating and cooling ducts, especially those running through the attic, crawlspace, unheated basement or garage as that improves the efficiency of your HVAC unit by as much as 20%. Have Weakland's Heating & Air Conditioning install a recirculating pump on your water heater. This eliminates the water wasted while waiting for the hot water to reach your tap. If you need an invoice, service agreement, receipt, work order copy or any other paperwork, contact us on-line at weaklandshvac@gmail.com and we will e-mail you the correspondence you need. This not only provides you with excellent customer service by giving you instant answers (thus saving you time), and your own digital record keeping, but it also eliminates the need for paper or ink. Never underestimate the power of good insulation. This applies to everything from your ductwork, to your coffee mug. Don't forget to address that drafty door or window too. Keep your gas tank full. It is better to fill it when it's half full instead of empty because an empty gas tank accumulates condensation, which makes gas consumption less efficient. Eliminate "vampire energy" that unnecessarily eats up electricity (and your money). For instance, turn off your screen saver altogether. Change your power-save options on your computer to shut off your monitor after a few minutes. When you move your mouse or start typing again, your computer automatically "wakes up". Use power strips that have an off/on switch too. Replace your incandescent light bulbs to Energy Star-rated bulbs that use less electricity, last longer and are easy to find at any retailer that sells light bulbs. Do you have a lot of paper cluttering up your home? Scan important paperwork and store it digitally so you have no need to keep a file cabinet. If it's not something you'll need to store, recycle the paper or reuse it as something else like insulation, scrap/memo paper, or even arts and crafts! Check to make sure that all of the weather stripping on exterior doors is in good shape and that they actually seal between the door and the door frame. Also check your windows to make sure that they seal properly. Keeping your windows locked also helps to insure that they are closed and sealed. Donate to - and shop at - thrift stores such as Goodwill. You'll be recycling perfectly usable items, and you'll be supporting your local economy. Before buying anything new, first check your local Craigslist or Freecycle. Put a stop to unsolicited mail - sign up to opt out of pre-screened credit card offers. While you're at it, go ahead and make sure you're on the "do not call" list, just to make your life more peaceful. Switch to shade-grown coffee with the "Fair Trade" label. There is a really good one that comes from Minden NV. Use cloth instead of paper to clean your kitchen. Be frugal, and make rags out of old towels and t-shirts. Getting delivery and takeout almost inevitably ends with a miniature mountain of packaging waste. But if you do order delivery, join coworkers in placing a large order (more efficient than many separate ones). Also, bring in a reusable plate, utensils, and napkins. If you do go out for lunch, try biking or walking instead of driving. Buy local and visit the Reno Co-Op.